dadamachines: music machines for everyone! The dadamachines automat toolkit enables you to tap, move and bang to make sound with the world around you. Hackable & open-source! 488 backers pledged €150,548 to help bring this project to life. 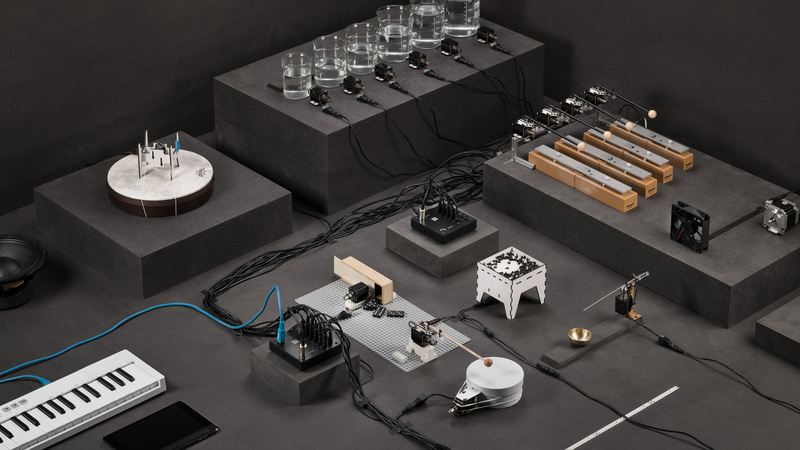 The automat toolkit is a plug & play MIDI-controller and accessories kit that allows anyone to build awesome music machines using the real world as their instrument. The center of each toolkit is the automat controller. Plug in your favorite software or hardware MIDI input directly into the controller. 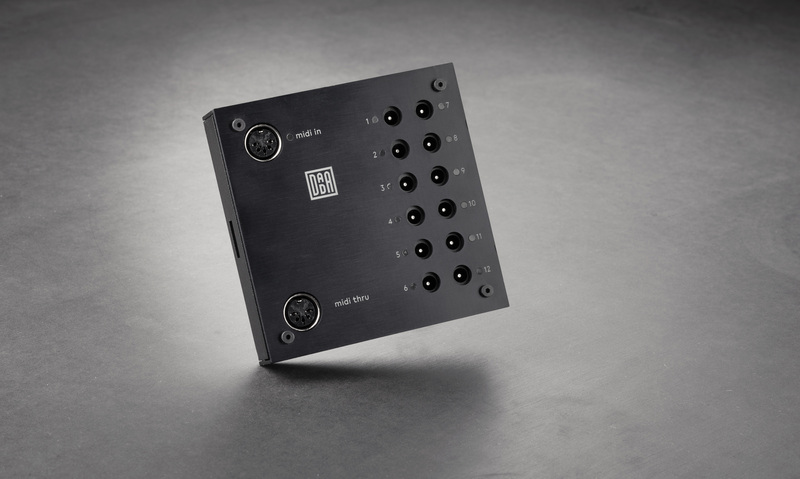 For output, automat controller has 12 universal DC outputs to connect motors, solenoids, LEDs - whatever you want to start playing. No coding or soldering required! The automat is plug & play – offering unlimited possibilities. Simply connect your favorite MIDI hardware device, music App or DAW and trigger the actuators of your choice to create a composition. Never played an instrument? Not a problem! Today’s music apps make it easy to get started. Back in November 2014, Johannes held a workshop with friends in Lund, Sweden. This very special evening provided the motivation to build the dadamachines project after seeing non-musician friends get excited and experimenting with sound. Ready to get hands-on and explore your ideas? Digital tools enable you to be precise and fast about trying new things. Combine anything with the automat toolkit and start creating your own sound. Taison is an old friend of Johannes and composes for theatre productions such as "20.000 Meilen unter den Meeren". This production became the original testing ground for the toolkit development. Want to create memorable moments when you preform? Build your own multi-sensory live experience faster than ever. With the automat toolkit, you can chain multiple controllers and go big. In early 2016, Johannes was approached by BLACKSPACE to develop an installation with them for AUDI called the MUSIC BOX that has since played 50+ live sets. Use one of many awesome music making apps available for iPhone or iPad. Integrate the toolkit into your studio workflow and with the DAW of your choice. You can also connect to your favorite MIDI hardware including keyboards, sequencers, drum machines and synth to play them alongside the toolkit. Hack your automat and use it with Firmata and the Ableton connection kit, Pure Data or MaxMSP. Connect your own circuits, extensions, sensors or shields or code your own software with Arduino. Get creative, and use many different actuators on one of the 12 universal DC outputs. [ 12-24V depending on your power supply - max 1.3A per channel ] You can do really cool stuff having a simple timeline based interface to control actions, not only to make music. The second most requested thing was a hacking guide. We already created a draft for a visual guide which will explain you the foundations of how to use the automat toolkit. As part of the stretch goal we will create a series of tutorials for our backers, too. Besides just having a piece of paper or video to explain things, we believe there has to be a central platform for the future of music making with machines / dadamachines. So I want to open and run a community platform based on discourse - like the guys from axoloti, monome and elektron run it for their communities It’ll be a platform where you can share new designs for adapters and elements, code or circuit designs and much more. So far the most-requested feature has been velocity. What exactly does that mean? For people not as familiar with MIDI, the velocity value essentially maps to how strong the solenoid movement is when it hits something. This means that if you have variable velocity then you have more variety in the sound you output. This variety can offer more expressive and less mechanical noise making - and as music makers that’s pretty cool. Currently, the toolkit allows changing the dynamic by changing the length of the note you are sending via MIDI which aleady offers a lot of possibilites. In order to give you guys even more control, we will create a configuration tool if we reach 190K EUR. This tool will allow you to customize the MIDI velocity values - meaning you can change the latency thereby ‘tuning’ the instruments you build. We are excited because we expect people can find cool ways to use velocity if they hooks up LED lights or DC motors as well. We will also make sure the tool includes the option to save favorite settings as presets. We have discussed this with several experts and are confident that we can build this solution given the constraints of the campaign funding. There are of course many different solutions to this problem, but we believe this is the best solution for the automat toolkit and is viable with the extra funding if we reach the stretch goal. To successfully build this configuration solution we will need extra help from a software engineer to consult on software and firmware. We have set the goal out far enough to be sure there is budget to include this extra testing and development. Together with your support, we want to make the first series production batch of the automat toolkit. In return, you will get an awesome reward and become a part of our community of music machine lovers! Early bird rewards are available for backers who support the campaign fast! These special rewards feature a big discount and will be numbered. Get one of the ready-to-go toolkit packages including everything you need to get started. The automat is hackable in almost every dimension and 100% Arduino compatible. Thanks to the toolkit's modular design you can extend the kit as needed. If you find one automat controller is not enough - chain them! The board can be programmed just like an Arduino so if you want to hack it, no problem. With the automat controller, its easy to open the casing and extend its functions with Arduino shields and your own additions. To make it even easier - every controller comes with an extra port for extension modules. We care about quality and a good relationship with our manufacturing partners. This is why the automat is made by Watterott electronic GmbH, a premier hobby electronics distributors in Germany and an official manufacturing partners for arduino.cc in Europe. All other components are made or sourced by partners in Germany. dadamachines is the project of Berlin-based Creative Technologist and DJ – Johannes Lohbihler. Johannes grew up in Bavaria, hailing from a line of seven generations of carpenters. Growing up among the Weilheim music scene that included producers and bands such like the Notwist, Lali Puna and Acid Pauli - Johannes was interested in music from early on. He started DJing and found inspiration to bring together the world of electronic music and analog tools - combining his background as a craftsman and love of music. During his masters studies in product and interaction design, he began building tangible musical instruments which eventually led to dadamachines. Given the complicated nature of most automata and music machines, Johannes began developing the automat toolkit, a simple plug-and-play kit that made music machines available to everyone. dadamachines isn't the first music machine. There are tons of other music makers exploring the possibilities of how to create sound all around the world. A few of our favorite contraptions are built by trimpin, godfried willem raes, felix machines, nick yulman, sonicrobots - check them out for inspiration. There are a lot of people who helped dadamachines get to this point. Here are just a few family and friends - without their encouragement this project would not be happening. To name a few: Teshia, Christin, Susanne, Sandra, Carola, Helene, Sophie, Anna, Michela, Monika, Justyna, Taison, Tobias, Cico, Alex, Bernhard, Moritz, Sylwester, Oliver, Ken, Adam, Markus, Christian, Bruno, Gösta, Tilen, Andrea, Thibault, Stephan, Teja, Philip, Tom, Johannes, Andrew, Tim, Axel, Hans, Macmeier, Florian, Rene, Daniel, Matas, Kalle, Rani, Vadim, Oli, Julian, Jens, Jelle, Ahmad, Lucas, Felix, Roey, Steffen, Jochen, Donald, Chris, Sebastian, Anastasia, Terry, Jeff, …and many more! Over the last 3 years, working on the automat toolkit – we have gone through several iterations of the electronics. They have been tested in real life environments - in workshops, in the studio, on tour and in installations. We have worked on DFM - Design for Manufacturing with our partners. All key components like cases, cables and motors have been ordered in sample batches to make sure they meet our specifications. We care about local manufacturing as it allows us to make a better product. For doing the production after Kickstarter, we have to setup an assembly line including all necessary testing procedures to reach our high quality standards. There are always things that can go wrong, especially when you are running a large production. We already have done pretests for the acquisition of the necessary CE and FCC markings, but need to be fully funded to pay for this expensive tests. This step is needed, so we are allowed to export the toolkit all over the world. And there is the risk that we have to do changes to the design of the product, most likely on circuit board level that delay our manufacturing process. We will give regular updates here on Kickstarter and we will make sure we let our backers know when things change in the process. All dadamachines products are proudly designed and engineered in Berlin, Germany. You're awesome! Thanks for helping us create new ways to make music! We will include your name as a contributor on the dadamachines website. <3! Get a super cool dadamachine logo t-shirt. Get the automat board for an early bird discount of 30% from the retail price of 129€. Get the automat board for an early bird discount of 23% from the retail price of 129€. Get the automat controller for an early bird discount of 30% from the retail price of 249€. You want to build your own custom setup? Then this is the reward for you! One automat controller in a super robust aluminum & steel case. Heavy duty stuff! Get the automat toolkit - S for an early bird discount of 30% from the retail price of 449€. Perfect to get started with music machines. Works well in the studio to record samples! But as well for many other crazy things! Get the automat toolkit - S for an special discount of 26% from the retail price of 449€. Get the automat toolkit - M for an early bird discount of 40% from the retail price of 549€. Get the automat toolkit - M for an early bird discount of 30% from the retail price of 549€. Get the automat toolkit - M - special for an discount of 20% from the retail price of 549€. Get the automat toolkit - L for an early bird discount of 25% from the retail price of 649€. Our MASSIVE Package! Take that one and you have a more adapters and all the elements PLUS 6 more SOLENOIDS! ! ! Get the automat toolkit - L for an special discount of 20% from the retail price of 649€.